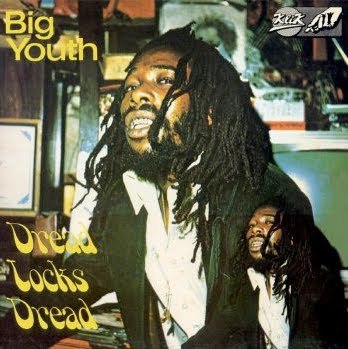 "Big Youth was one of the most influential DJs on the Jamaican scene in the 1970s, helping to popularize the tradition of singers "toasting" over records. The shrieks that kick off the title track command the listener's attention immediately, and belie Big Youth's jazzy, laid-back style. "Screaming Target" is a clarion call for Jamaica's youth to educate and better themselves, and typifies Big Youth's cool, mesmerizing performance with razor-sharp, socially conscious lyrics. "Screaming Target" is still on the shortlist of historically important reggae albums decades after its release." I don't know who photographed the covers of Big Youth's first full-length debut album, Screaming Target, or his later Dreadlocks Dread, but the preceding post on Bob Marley prints at Snap Galleries reminded me to go in search for them. Screaming Target has some killer cuts Big Youth made with then 20 year-old producer Gussie Clarke. Both continue to be my all time favorite reggae albums ever. At an early Big Youth concert long ago, we watched as two men had to hold him up to get on stage and prop him up throughout the entire incredibly pure stoned-out stream-of-consciousness performance. 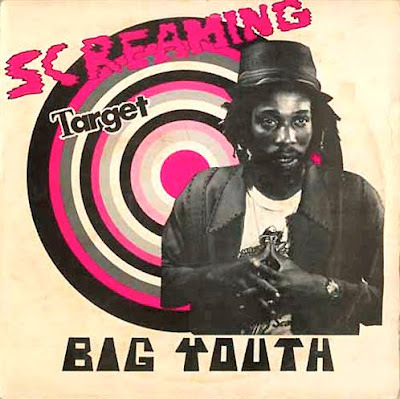 Screaming Target: Big Youth, with background vocals by Gregory Isaacs, Dennis Brown, K.C. White. "It was while bunking off school to wait for Bob Marley to arrive for his soundcheck at the Speak Easy Club on London's Margaret Street that Dennis's music photography career really began. Bob Marley was so taken with the young teenager who was waiting for him that he invited Dennis to come along and take pictures on the remainder of the tour. Running home to Dalston, Dennis packed his bag and jumped on the bus. His photographs of Marley and The Wailers became famous the world over, appearing on the cover of Time Out and Melody Maker before Dennis had even turned 17." Stephen Bruton, with music collaborator and fellow Texan, T-Bone Burnett, created the original 'classics' for the film Crazy Heart. JEFF BRIDGES won the Best Actor SAG Award and the Best Actor Golden Globe Award for his amazing performance in Crazy Heart...and he received lengthy standing ovations both nights! This week you can view Bridges must-see photographs he took while making Crazy Heart here. More about Crazy Heart's soundtrack and video's here. More about Jeff Bridges Wide-lux Camera here. Wall Space Gallery and it's Artists support 100% of the sales of these prints to Doctors Without Borders. Tom Chambers, Aline Smithson, Lydia Panas, Randall J. Corcoran, Priya Kambli, Ron Reeder, Bill Finger, Kristen Fecker Peroni, Charles Grogg, and Mitch Dobrowner. Prints in an Edition of 10: $50. Haiti Relief Benefit Print Sale: Emerging Photographers Support The People Of Haiti. Each 8 x 10" photograph is part of an edition of 10. Each photograph is $50. 100% of the proceeds will be donated to Doctors Without Borders. DOCTORS WITHOUT BORDERS, known in Haiti as Médecins Sans Frontières (MSF), is an international medical humanitarian organization created by doctors and journalists in France in 1971. In 1999, MSF received the Nobel Peace Prize. As of today, thousands of patients have been treated so far at several Doctors Without Borders locations in Haiti. 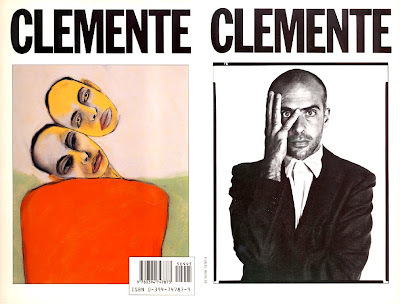 An Interview With Francesco Clemente. Front Cover Photograph (c) Richard Avedon /All Rights Reserved. 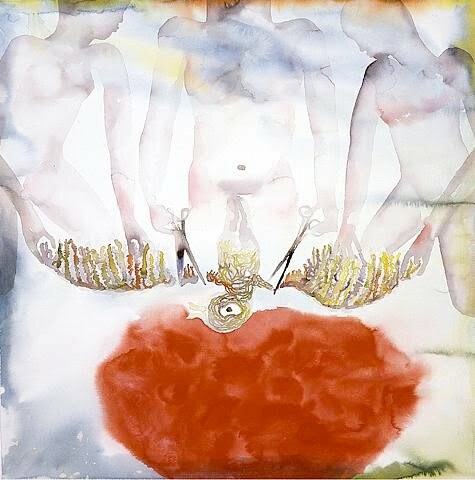 "She and She" Back Cover Painting (c) Francesco Clemente /All Rights Reserved. "...about the publication of your book of poems, Castelli di Sabbia. (Naples: L’Arte Tipografica, 1964) "I had been reciting it to my mother since I was five or six, and it was published against my better judgment. It was enormously embarrassing, and it made me into a painter, actually, because I decided that to be a poet was too embarrassing; it was too revealing, and I wanted something more obscure to deal with. I thought of painting that way. That was when I was eleven or twelve years old." "Paintings are simple things. They are important not so much for what is in them as for what is not there. When we talk of the Renaissance we talk of something fragile; the surprise is that at a certain point, after a thousand years of Christianity, Renaissance artists looked at their bodies again, and looked at their faces, and looked at the world as a sensual place. This feeling of surprise happens again in Tiepolo's skies, and even down to de Chirico's earliest painting. If we talk of Piero della Francesca, what comes to mind is the light. There are two lineages of light in painting. One is a secular light: from Caravaggio to de Kooning. The light is outside; it comes down on things, and makes them what they are. But if we talk of Piero, or talk of Roman paintings, or of the Pompeian paintings, we talk of a light that comes from within and that has nothing to do with the history of man. It is a light that is before the history of man. Giotto is unique because you don't know exactly which way the light goes: his is already a completely secular point of view, but still the light is treated as an inner flow. There is really no one else like him; that degree of mystery is nowhere else. We have to talk in terms of light, because if we talk in terms of formalities, what can we get out of it?" "It could be a step forward to realize that the rational picture of the world is also an imagination; it has the same reality as a myth. It is the product of the mind; it is not more substantial than the mind. When we talk about mythology we are talking about questions of history, of rational thought and rationalized memory of our past. History is the most tragic product of the rational mind–a picture from which there is no way to escape. The picture of the world that history gives us is the picture of a dead person who looks over his own life. It is as if we are all dead, and we are looking at the world in a glass case. How can we get away from this? I have no answer for it." When I was 13, the year I fell in love with photography, I also discovered North American realism in painting, literature and photography. Here in São Paulo, we are sons and grandsons of Europeans that came here after the wars. The European sensibility and aesthetics are still very strong among us. I was taught all the "isms" of the 20th Century that came from the old continent, along with the most popular work from the USA, such as Abstract Expressionism, Pop Art...but after "In The American West", I saw that art could be very mature, even sober, without losing the power of expression. Today it sounds obvious, but at the time it really blew my mind. CAIO FERNANDES, born in São Paulo, Brazil in 1975, studied Psychology, Art and Photography at both the University of São Paulo and at Brazil's most prestigious school for Art and Architecture, the Fundação Armando Alvares Penteado (FAAP). Studying under artists Evandro Carlos Jardim, Claudo Mubarack and Elisa Bracher, he worked as studio assistant to Ms. Bracher for a short period preparing exhibits for Germany and Rio de Janiero. Fernandes' work is sometimes described as Realist, "though the sheer intensity of his work sets him apart from most contemporary Realist painters. With a highly individualistic style of painting, Caio reveals the raw physical characteristics and inner tensions of his subjects. A strong interest in Kardecist Spiritism, which proposes an intricate set of perspectives of the "self", is apparent in his self-portraits. Though Caio affirms that a self-portrait can only be considered as a visual reflection of himself, "There is no conceptual speech behind it," he believes strongly that the only important thing is the painting itself."